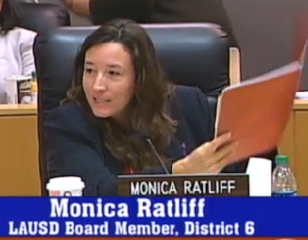 In what appears to be a strategy to undermine the Broad Foundation’s proposal to move half of district students into charter schools, LA Unified board member Mónica Ratliff is exploring the possibility of turning the entire district into a charter organization. Part of the agenda of the Nov. 17 meeting of the district’s Budget, Facilities and Audit Committee, which she chairs, is a discussion of a report from district lawyers about the possibility of converting all of LA Unified schools into charters. The report was made public today. Such a move would immediately address the school board’s chief criticism of the Broad plan, that it’s a “some kids, not all kid’s” approach for improving academic achievement in the district. Ratliff was not available today to discuss the issue, but board president Steve Zimmer suggested that a wholesale charter conversion might not be ideal, given the multitude of challenges currently facing the district. They include finding a new superintendent by the end of the year and resolving mounting financial challenges threatening district insolvency. Converting LA Unified into all-charter status would also make the state Superintendent of Public Instruction and the State Board of Education the overseers of the district, serving in the same capacity as a Charter Management Organization. In effect, the state would have final authority over board decisions. According to the legal department’s analysis, “The (state board) would have oversight responsibilities over the All Charter Districts” and “oversite fees” of 1 percent of revenues from the all-charter district would be paid to the state. Included in the legal department’s material is a slightly-out-of-date list of all-charter districts that currently exist in California. At the moment, there are seven, four of them with only one school in the district. The other, Kingsburg Elementary Charter School District, south of Fresno, is the oldest of the group and the largest, now operating with seven schools serving 2,400 students. By comparison, LA Unified has 1,274 schools. “We’ve been at it like this for 20 years in all,” said Wesley Sever, superintendent of the Kingsbury district. He said his schools are funded by Fresno County; they receive no private financial support, and the district’s teachers are non-union. The inquiry by Ratliff, which her office said came from a query from board member Richard Vladovic, seems part of the escalating charter wars that have taken on a new urgency with the Broad proposal, which has been roundly attacked by the teachers union and LA Unified board members opposed to further and rapid charter creation. At the next board meeting, in December, the board will vote on a measure to condemn the Broad plan or any other plan that doesn’t include all students. Further, Ratliff this week introduced a proposal that would ask for a greater degree of transparency from charter schools, including requirements to comply with state guidelines for open meetings and inform parents about school-related items like traditional school do. Representatives from the California Charter School Association said they were planning to meet with Ratliff to soften the language of her proposal, but they weren’t aware of this latest query about district conversion.